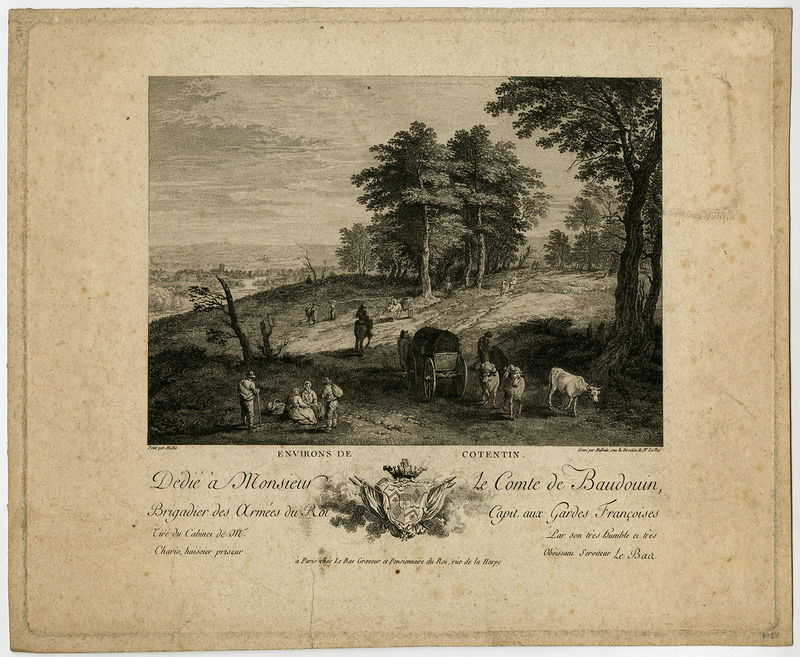 Subject: Antique print, titled: ''Environs de Cotentin.'' - A landscape with figures near Cotentin in France. Condition: Good, given age. A printer''s crease in the lower margin. Overall foxing and staining. General age-related toning and/or occasional minor defects from handling. Please study scan carefully. Medium: Etching/engraving on handlaid (verge) paper. Size (in cm): The overall size is ca. 29.5 x 24.3 cm. The image size is ca. 19.5 x 18.5 cm. Size (in inch): The overall size is ca. 11.6 x 9.6 inch. The image size is ca. 7.7 x 7.3 inch. Description: Published by Lebas, c. 1780. Jacques Philippe Le Bas or Lebas (1707-1783) was a French engraver. Le Bas was engraver to the Cabinet du roi and successfully produced engravings after several paintings by different artists. His oeuvre amounts to more than 500 works, including many large portraits after Vernet, and several works after van de Velde, Parrocel, Berchem, Ruysdael, Watteau, Oudry and Lancret. Artists and Engravers: Made by 'Malbaite' after 'Micho'. Georges Malbest (also Malbete or Malbaite, 1754-1843) was a French engraver specialising in book illustration. We have been unable to find out more about Micho.